[it] was voluntary but should have been compulsory, for even as it was it saved many lives…..The Great War has shown for ever how effective this treatment is. The outbreak of enteric among the troops in South Africa was a calamity the magnitude of which had not been foreseen……There is one mistake which we have made, and it is one which will not, I think, be repeated in any subsequent campaign. Inoculation for enteric was not made compulsory. 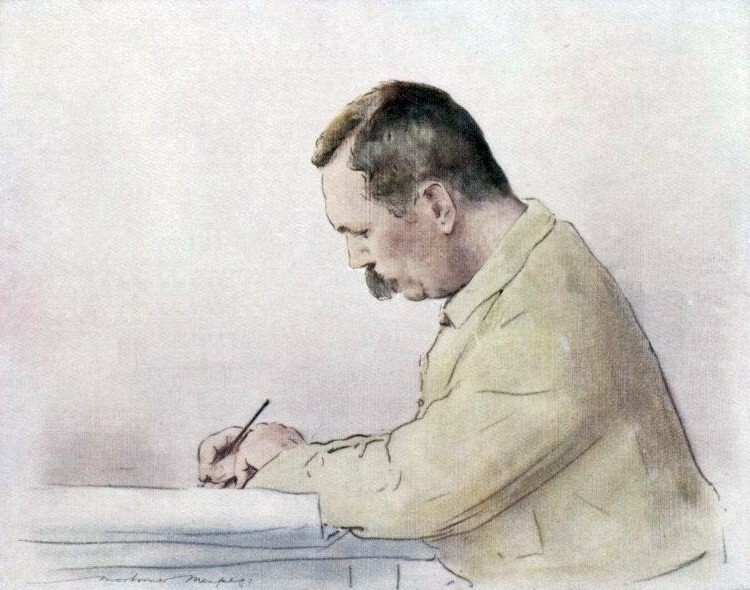 Sir Arthur Conan Doyle, by war artist Mortimer Menpes, public domain via Wikimedia Commons. Menpes described the hospital as resembling a slaughterhouse and commented on how tirelessly Conan Doyle worked. The gap between theory and practice – germ theory had only recently gained traction and people were also worried about the side effects of typhoid inoculation – allowed disease to flourish in this, as in other conflicts, with preventive measures not being given sufficient attention, and the medics who promoted them often having a relatively lowly status. This article argues that the lesser status of medical officers allowed preventable diseases to flourish in the Boer War, and that the failure to learn from that experience meant that typhoid vaccination was still optional for British troops by 1914. Conan Doyle pressed the issue of inoculation but his testimonies to two Royal Commissions were perhaps tempered by emotion and political considerations, amidst public controversy about both the war itself and the medical services provided to the troops. Typhoid vaccination of US soldiers in World War 1. 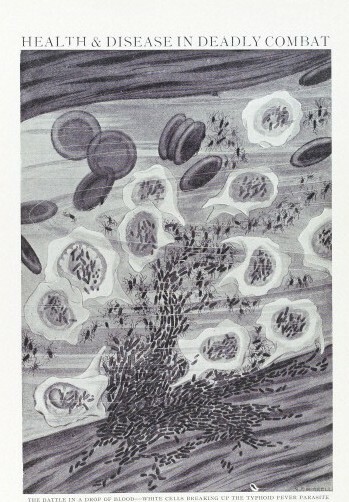 Public domain, via US National Library of Medicine. Medical and surgical advances, military discipline, immunization and antitoxins, and better hygiene and sanitation, all contributed to the well-known reduction in deaths due to disease less than two decades later, in World War 1. Nonetheless, in 1914 Britain was “abysmally prepared” for the war against disease, argued Professor Francis Cox in a Gresham College lecture in March. Disease had been crucial in the outcome of previous conflicts, with deaths from disease outnumbering those from combat, sometimes by as many as two to one. The military had not, in the past, been slow to understand the implications: in 1346, some Tartars seem to have catapaulted the bodies of plague victims over the walls of the besieged city of Kaffa on the Black Sea, and in North America in the 1760s, British General Lord Amherst considered sending smallpox-infected blankets to the enemy. The battle in a drop of blood, white cells breaking up the typhoid fever parasite. Wellcome Library, London. Captioned “Health and DIsease in Deadly Combat”, this image appeared in a general science publication in 1912. Despite this understanding, and against a background of numerous serious infectious diseases prevalent in Europe in the early twentieth century, Britain was not well prepared. 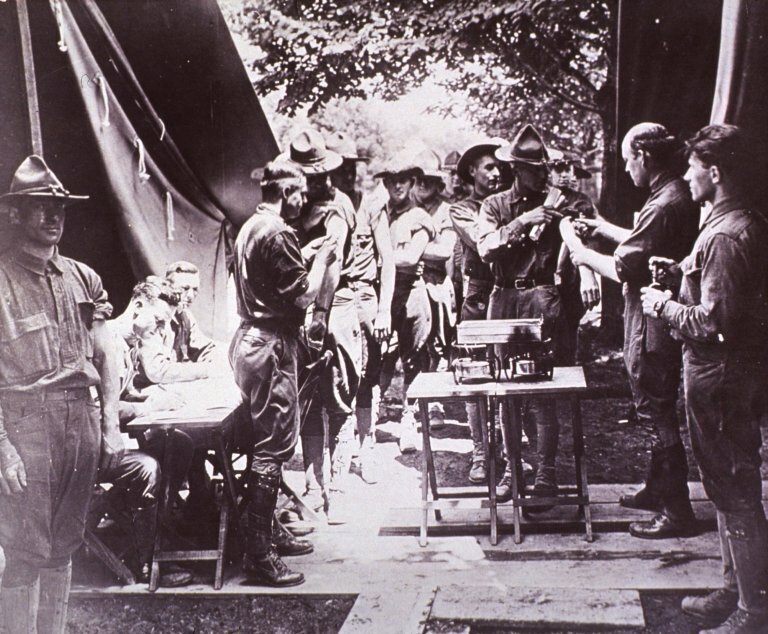 Neither army doctors nor public health doctors were well respected, and many of the civilian doctors recruited into service had graduated in the 1880s, before general acceptance of the role of microbes in disease and were resistant to the idea that it was not the foetid conditions of the trenches that were responsible. Although on first appearance, combat deaths outnumbered deaths due to disease for the first time, this does not include those of the 50 million dead of Spanish ‘flu (plus those of other diseases) whose deaths resulted directly from the war. The end of the war provided the ideal conditions for the spread of disease, and Professor Cox argued that, tragically, many of these conditions were self-made. Too much attention was paid to getting the wounded fit enough to return to duty, and not enough to simple disease prevention measures, for the war on disease to be truly won. With precautions and with inoculation all those lives might have been saved. Cirillo VJ. Arthur Conan Doyle (1859–1930): Physician during the typhoid epidemic in the Anglo-Boer War (1899–1902). J Med Biogr 2014; 22(1): 2-8, accessed 15 June 2014. Cox F. Transcript of lecture The First World War: Disease, the Only Victor, delivered at the Museum of London 10 March 2014, website accessed 16 June 2014. Doyle AC. The war in South Africa: the epidemic of enteric fever at Bloemfontein. Letter to the editor, BMJ 1900; 2: 49-50, accessed 16 June 2014. Doyle AC. The Great Boer War, first edition 1900, Chapter 22 accessed 16 June 2014. Doyle AC. Memories and Adventures, first published by Hodder and Stoughton, London, 1924. Project Gutenberg of Australia ebook, downloaded 12 June 2014. Murray CK, Hinkle MK and Yun HC. History of infections associated with combat-related injuries. J Trauma Inj Infection Crit Care 2008; 64:S221–S231, accessed 16 June 2014. Roden C. Arthur Conan Doyle: A brief biographical study. Website of the Arthur Conan Doyle Society, accessed 16 June 2014. Rodin AE and Key JD. Sir William Osler and Sir Arthur Conan Doyle: Medical humanists. Hum Med Healthcare 1990; 6(1), accessed 16 June 2014. Ziegler M. Plague at the Siege of Caffa, 1346. Contagions blog 2012, accessed 16 June 2014.